More of a visual learner? No problem! Check out our video review and unboxing at the bottom of the page! The Razer Ouroboros is Razer’s crown jewel in their line of gaming mice. It is a wireless/wired mouse with a wide range of customization options that allows gamers to tweak the mouse to perfectly suit their grip style and hand size. 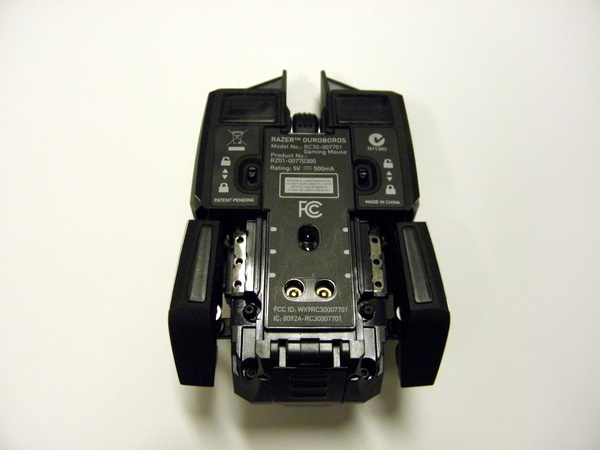 The mouse runs on a single AA NiMH battery and features an 8200 DPI sensor powered by a 32-bit ARM processor. 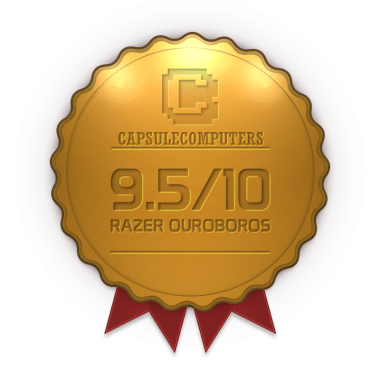 The packaging for the Razer Ouroboros is meant to catch the eye on retail shelves. The mouse is contained in a big plastic box that mounts the mouse in the centre as if it was a diamond in a museum display piece. Under the clear plastic box is the USB cable, a small screwdriver, an AA NiMH battery, two alternate side pieces for customizing the mouse, and an instructional package that also includes some Razer stickers. In the plastic box, the base station and mouse is securely clamped in. In fact, the mouse is so securely clamped in, I struggled to remove the mouse from the box. I ended up having to unscrew the display before I could figure out that I could remove the mouse from the box without tools. I would have liked to see some instructions on how to remove the mouse from the box. Installing the mouse is very easy, simply plug the included USB cable into the mouse or the base station. The mouse works immedietely with Windows 8, even without an internet connection. My mouse even came synced to the base station right off the bat. Syncing can be done by pressing all four gray side buttons on the mouse and the sync button on the base station at once. The design of the USB cable is great. The cable itself is wrapped in braided cloth, which helps cut down on snags and tangles. Although it uses the standard Mini USB plug, I noticed that most cables were too big to reach the port in the mouse. The cable provided by Razer is actually slightly thinner and has a ridge that fits into grooves cut into the mouse and base station. The grooves ensure the cable will only be able to fit right side up, which makes it easy to find the right way to plug in the cable, instead of hunting for the mysterious third side of the USB cable. The mouse is a medium sized mouse at its smallest configuration. A small eyeglass screwdriver made from a solid piece of metal is included with the package. It is used for loosening two small screws on the bottom of the mouse. From there, the back of the mouse can be pulled out to adjust the length of the mouse. Longer mouse lengths are great for gamers with larger hands, especially those who use a palm grip on their mouse. 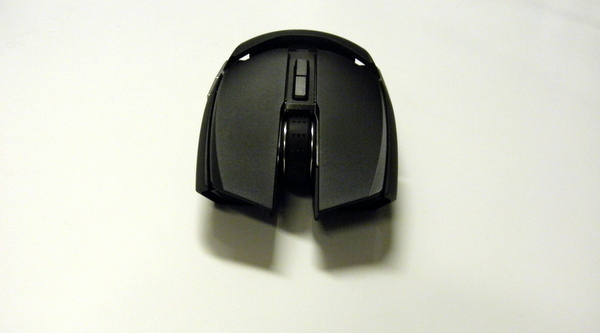 A wheel on the back of the mouse allows users to change the mouse’s slope. The back of the mouse can go from pointing downwards towards the mouse pad to a steep upwards angle. 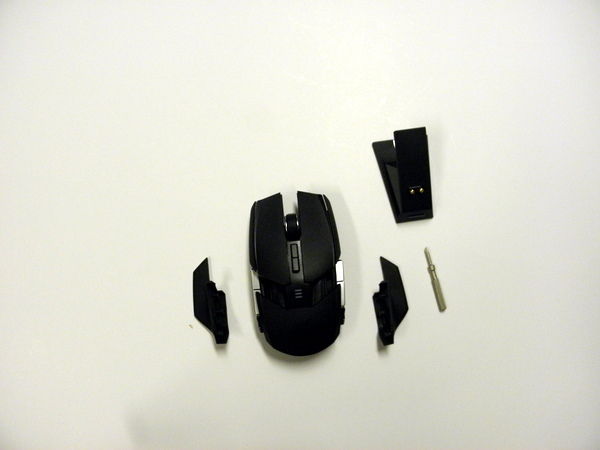 By completely removing the back the of the mouse, the user can access the battery compartment. The battery is charged by mounting the mouse on the base station or plugging the USB cable directly into the mouse. However, I still would have preferred to have easier access to the battery compartment for quickly swapping between batteries for wireless only mousing. 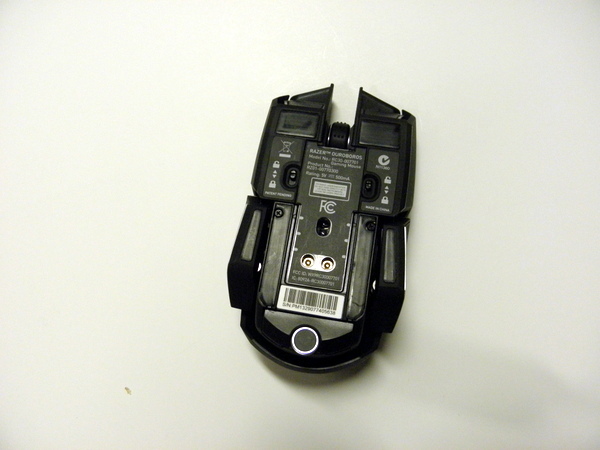 The sides of the mouse have three buttons each. Two of the buttons are very obvious, but the third button can found by squeezing the sides of the mouse. There is a button either side of the mouse, but they are very stiff. Squeezing the button with the thumb does take quite a bit of force, but squeezing the opposite button with a pinkie finger is nearly impossible. It is possible to disable these buttons completely by sliding one of two lock switches on the bottom of the mouse. The side panels can be replaced. Users will have the choice between flat piece or a flared piece that keeps fingers off the mouse pad. I really like the fact the side panels are attached by three small magnets. It makes the panels easy to change that does not move around once secured. The top of the mouse has two buttons below the mouse wheel that by default switch the sensitivity settings of the mouse. The mouse wheel has a series of sharp dots to provide an impressive amount of grip. No matter how sweaty my hands became, the mouse wheel never slipped with the texture. The left and right mouse buttons are generously sized. All of the buttons click nicely, thanks to the high quality Omron switches used. These switches are amongst the best in the industry for mice, and the nice crisp click shows. The base station is rather small and unobtrusive. The bottom is covered with an incredibly sticky surface that does not leave any unpleasant residue. I accidentally put the base station on the carpet when first unpacking the Ouroboros and the base station lost its stickiness from all the carpet fibres. I found a little bit of water was able to clear the fibre and return the surface to its original stickiness. The base station has a button surrounded by a green light that signals it is connected to a computer and to sync the mouse. There are two gold prongs on the top of the base station to provide power to the mouse. Here came my biggest complaint with the mouse. It can be a little hard to align the mouse perfectly onto the base station. It takes a while to learn as those two prongs are the only things that provide any reference on where the mouse needs to rest. There were several times I accidentally jammed one of those prongs into the laser sensor. 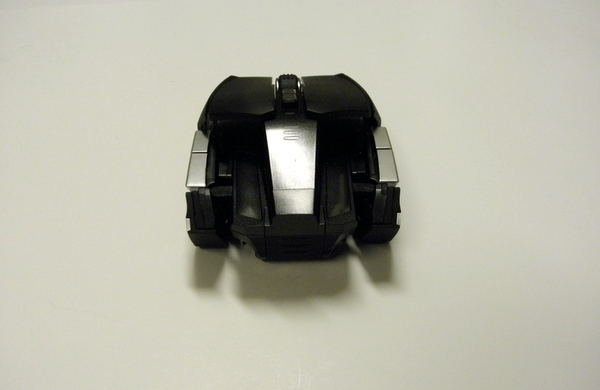 The prongs do sink into the base station, so no permanent damage was done. The mouse has very subtle green LED lighting and a finely pebbled surface. I really liked the surface’s texture, which provides great grip without the rubbery coating that can flake off with rough use. There are three LED bars on the top of the mouse that shows a rough estimation of how many hours of power the mouse has left. A more accurate readout on the remaining power can be found in the Razer Synapse 2.0 software. The mouse relies heavily on the Razer Synapse 2.0 software for tweaking things under the hood. The most important thing about the Synapse 2.0 is the fact everything can be stored in an unlimited amount of profiles. All these profiles are stored on Razer’s servers, so gamers can access them as long as they can install the Synapse software on a computer. Unfortunately, the mouse lacks any on board profiles, so this may be difficult for gamers who attend tournaments that ban installing any software on the tournament computers. Within the software, users can create profiles that are launched based on .exe files. So launching Bioshock Infinite will trigger one set of macros, while launching Battlefield 3 will bind a completely different set of macros to the mouse. The macro creator is very simple to learn and use. 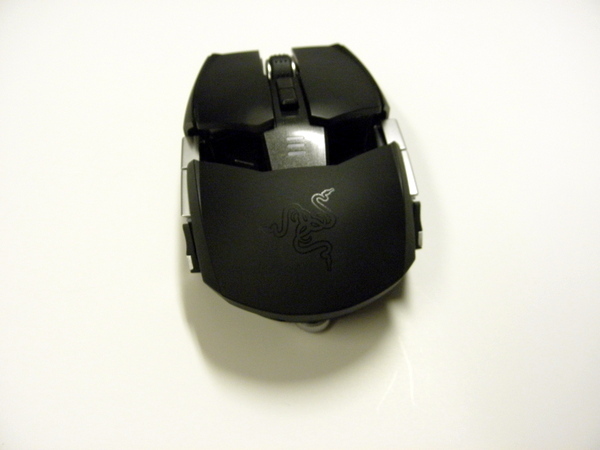 When paired with a Razer keyboard, several Ouroboros features can be triggered by keyboard macros. Additionally, tweaks to lighting and sleep mode behaviour can be made from within the Synapse software. Personally, I found the mouse was a little slow to exit sleep mode, but by default the mouse only goes to sleep after three minutes of idleness. The Ouroboros is runs on an 8200dpi 4G dual laser sensor. In use, I found the mouse to be smooth and accurate. Using the Synapse software, the mouse can be calibrated to a specific mouse pad for best performance. By default, calibration profiles for all of Razer’s mouse pads are preloaded, but any surface can be calibrated by dragging the mouse over the whole pad. Once the pad it calibrated, it is possible to tweak the distance the mouse will track the pad as it is being lifted off the mouse pad. The wireless performance was swift. Razer reports a 1ms response rate when playing via wireless and wired connection. In practice, I could not tell the difference in response time either. The battery is rated for 12 hours of use when the battery is new. I experienced a similar battery life in my testing. The Ouroboros definitely does not sip battery power, but 12 hours is plenty to last an entire day’s worth of gaming and it is very easy to just plug the mouse in. At $149.99 USD, the Ouroboros is a pricy mouse, even for a wireless mouse. But its prices are completely in line with its competitors’ pricing for a mouse with similar features. It has an incredibly solid set of features and can be customized to suit almost all styles of gamers. Although it can be a little slow to get out of sleep mode and putting it on the base station will take a little practice, the complaints are extremely minor. 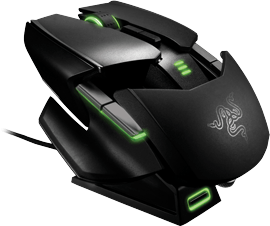 If you can get over the price, the Razer Ouroboros is a fantastic mouse.